Diwali is fast approaching and many of you must have started planning the list of sweets and snacks to prepare for Diwali. 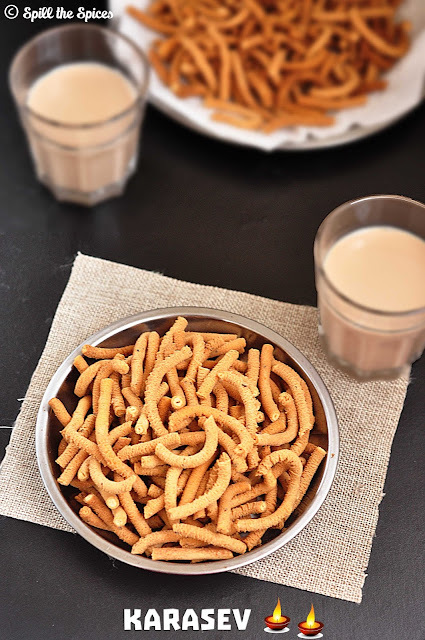 This year I wanted to try my hands on some easy Diwali snacks. 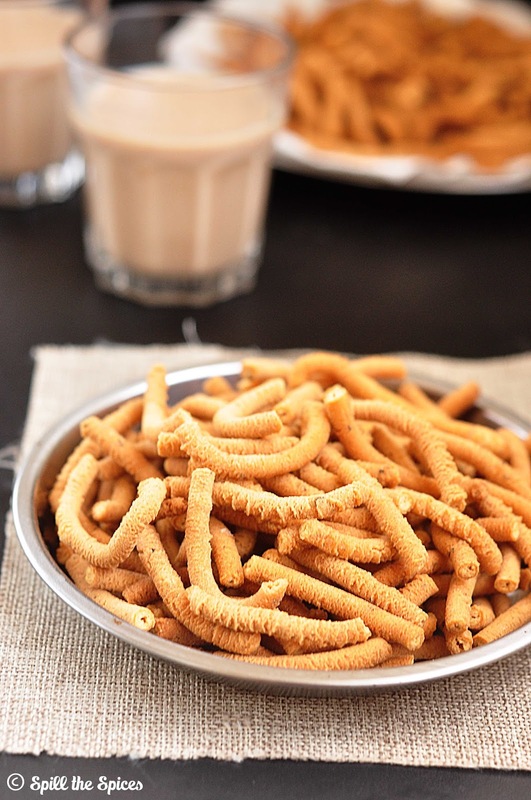 My first attempt is the karasev, a popular and quite easy snack made during Diwali. Karasev is a spicy deep fried snack made with gram flour and rice flour, made with different flavorings like pepper, garlic etc. Traditionally karasev is made by rubbing the dough through a ladle with perforated holes. This method needs lot of practice, so using the murukku press is much easier and less messier too!!! Karasev can be made in bulk and stored in an airtight container for a month. I tried the pepper flavored karasev and was so happy that it came out really well in my first attempt itself. The roasted gram flour gives the karasev a soft texture, making it not too hard. Even beginners can try this karasev. 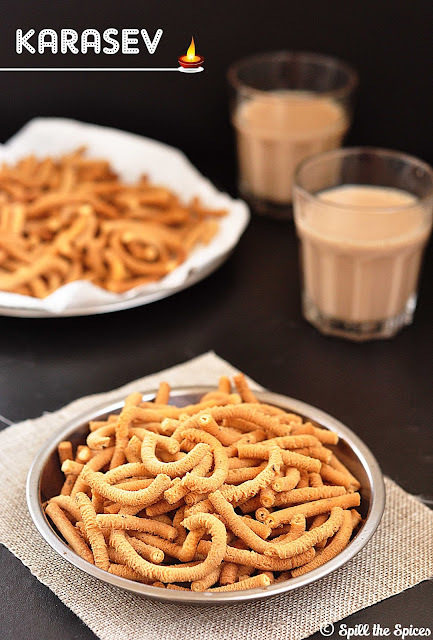 Enjoy this crispy additive snack with a cup of tea or coffee. 1. Coarsely powder the pepper using a mortar and pestle or in the mixie jar. Grind the roasted gram to a fine powder. 2. In a large bowl, sieve the besan, rice flour and roasted gram powder. Add butter, red chilly powder, pepper powder, salt and mix well until butter is well incorporated. 3. Add water little by little and make a smooth and soft dough. Divide the dough into 2 equal portions and keep it covered with a wet cloth. 4. Take the murukku press with the disc having 3 (or 5) holes. Fill the murukku press with 1 portion of the dough. 5. Heat oil for deep frying. Squeeze into hot oil in big circles. Do not overcrowd or make layers. Cook in medium heat, turning over to cook both sides. 6. Once the bubbles reduces, the 'shhh' sounds ceases and the sev turns golden brown, remove and drain on a paper towel. 7. Break into pieces and cool completely. Store in an airtight container. The dough should be soft enough to squeeze through the holes. If the dough is hard and tight, sprinkle few drops of water and make the dough soft. Add red chilly powder and pepper powder according to your spice preference. The oil should be hot when you squeeze in. Turn down the heat to medium while cooking the sev. If the dough becomes dry or hard for the last batch, sprinkle few drops of water and make the dough smooth. 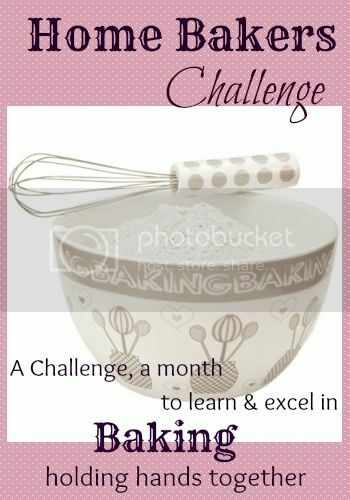 Home Baker's Challenge is back, thanks to Priya and this month's host Rafeeda of The Big Sweet Tooth, To kick start the challenge. 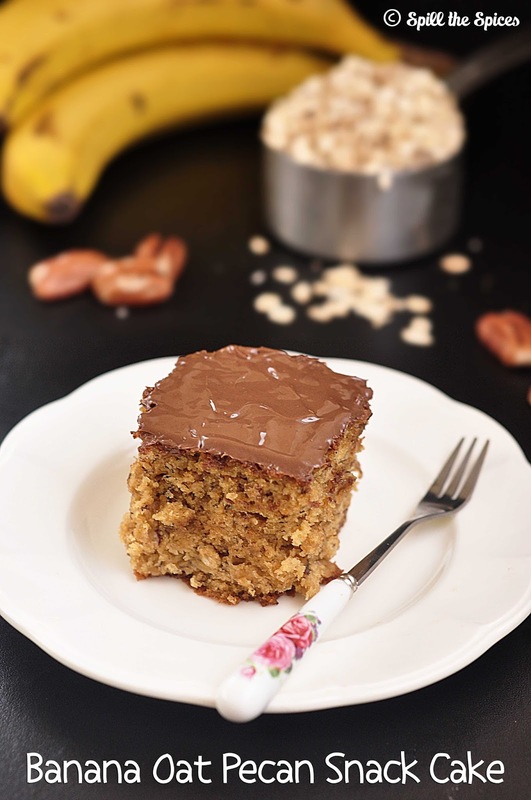 Rafeeda suggested healthy baking recipes with oats as one of the main ingredients. 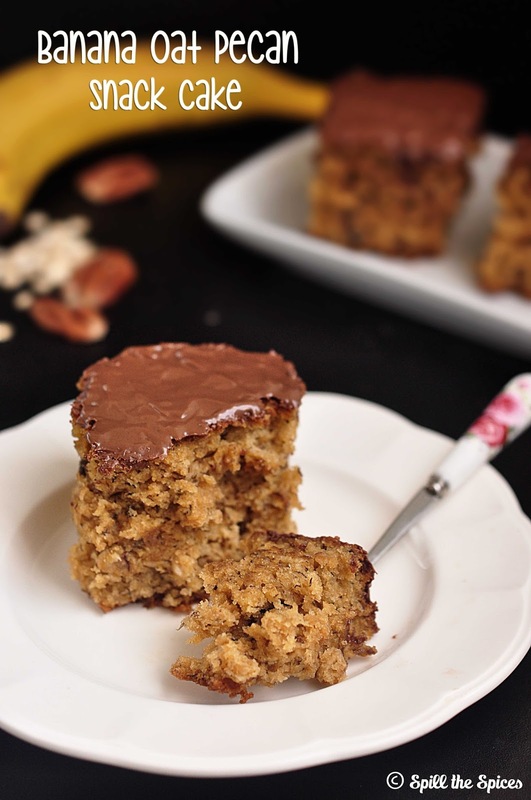 The recipes chosen by Rafeeda were all so good, but my heart and mind was on the banana oat snack cake. I was in no mood to try out an eggless version, so was eagerly waiting for Navratri to get over to bake this cake. For an eggless version, I think flaxseed would be a great substitute. The whole house was filled with a lovely aroma, equivalent to nendrapazham (ripe plaintain) being fried in ghee!!! This cake is loaded with oats and with a combination of whole wheat and all-purpose flour. I reduced the butter yet the cake turned out soft and moist. The cake was not so sweet, so I topped with some warm nutella. 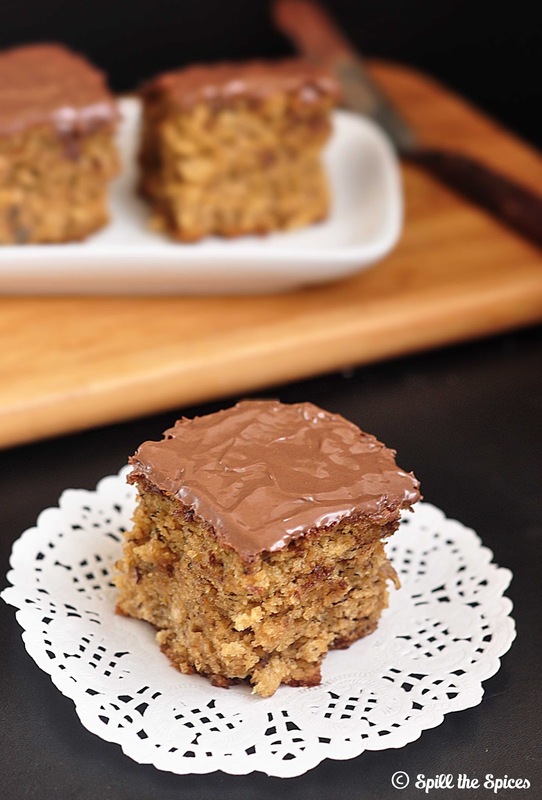 You can leave out the nutella and add 1 cup of sugar for a sweeter cake or go for your favorite frosting. This cake is aptly called a snack cake as one small piece itself makes you feel full, perfect for kids as a after school snack or with your evening tea or coffee. 1. Preheat oven to 180°C | 350°F. Grease and flour a 8 x 8 inch square baking dish. 2. 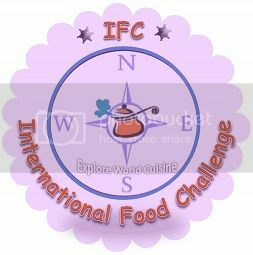 In a medium bowl, add wheat flour, all-pupose flour, oats, baking soda, salt and mix until well combined. 3. In a large mixing bowl, add the butter and sugar. Beat until light and fluffy. Add the eggs one by one and beat well. 4. Add the buttermilk, yogurt, vanilla essence, mashed bananas and blend until well combined. 5. Add the dry ingredients, pecans and fold until just incorporated. Pour batter into the prepared baking dish. 6. Bake for 35-40 minutes or until a toothpick inserted in the center comes out clean. Remove and cool on a wire rack. 7. Microwave the nutella for 10-15 seconds and spread on the cake. The nutella topping is optional. You can try a peanut butter topping or any frosting. The cake is not so sweet. For a sweeter cake, add 1 cup of brown sugar. You can substitute pecans with walnuts. Navratri is celebrated for nine days and each day we prepare different variety of sundals along with other offerings. 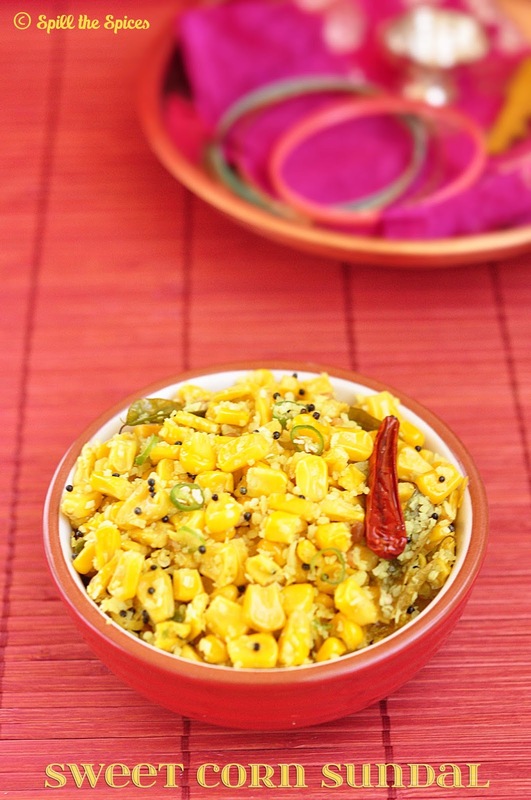 Sweet corn sundal is the most easiest sundal recipes. It does not require any soaking like sundals using lentils and beans. If you are working women, this sundal is apt for you as it takes very less time to make. 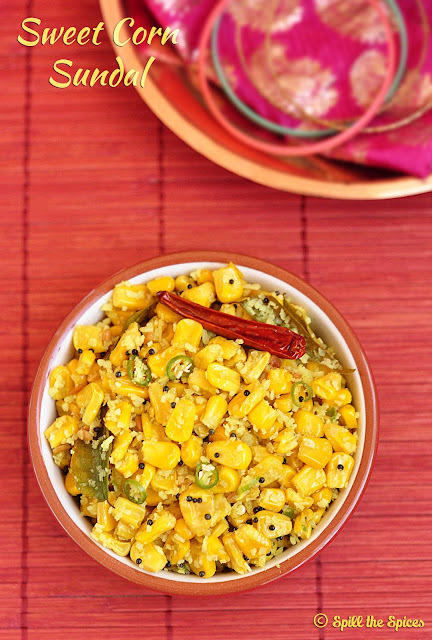 You can make using fresh corn cob or frozen corn kernels. This sundal is sweet, slightly spicy and tangy. Not just for the festival season, this sundal can be made anytime and enjoyed as a snack or salad. 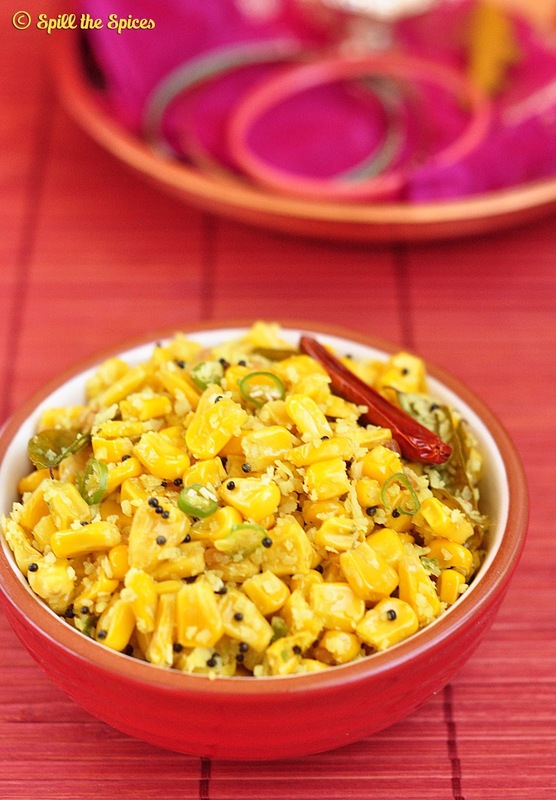 Kids love swet corn and they will surely love this sundal too. Try this simple and quick sundal recipe for this Navratri festival. Check out other sundal recipes too. 1. Boil the sweet corn with little water, turmeric powder and salt. Cook till its soft. Drain the water and keep aside. 2. Pulse the green chillies and coconut together just 1-2 times. 3. Heat oil in a pan and add mustard seeds. When it splutters, add urad dal, asafoetifa, red chilly, curry leaves and fry till dal turns golden. 4. Add the sweet corn and fry for 1-2 minutes. Add green chilly-coconut mixture and fry for 2-3 minutes. Remove from heat and add lemon juice. Instead of grinding green chillies and coconut, you can add green chilly while tempering and coconut at the end. If using corn cob, pressure cook for 2 whistles or until soft and remove the kernels. For this month's Bread Bakers, Wendy of A Day in the Life on the Farm suggested fall breads as the theme. We have to bake any hearty bread that reminds us of the fall. Pumpkins were the first thing that came to mind and I decided to make a quick bread with pumpkin. 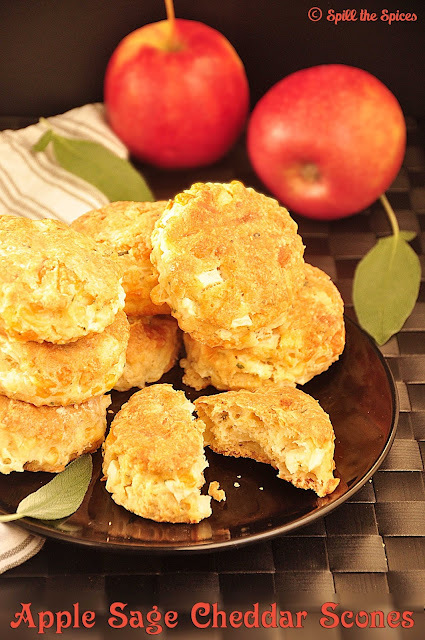 Unfortunately it did not come well, so that at the last minute I decided to make these savory scones. 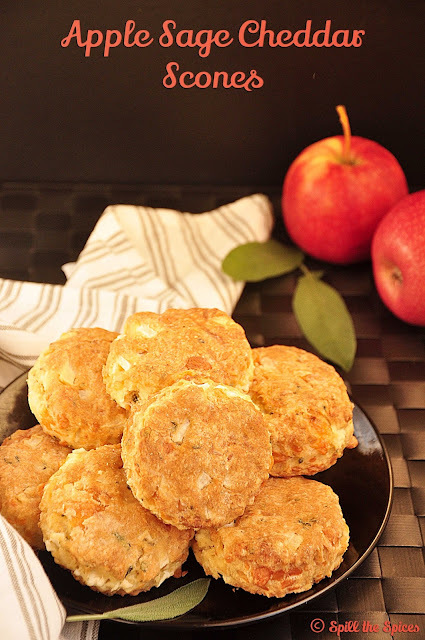 The combination of apple with sage and cheddar was lovely. You really don't need anything extra to serve along these scones. Store them in an airtight container and warm them before serving. 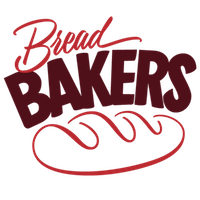 If you love bread baking and want to be part of this wonderful group, go through the details at the end of the post. 1. Preheat the oven to 190°C | 375°F. Line a baking sheet with parchment paper. 2. In a large bowl, sift together the flour, baking powder, baking soda and salt. Add the sugar and mix. 4. Add apple, sage, cheese and black pepper and mix together until well combined. 5. Add the buttermilk and mix together until just combined and the mixture has formed into dough. 6. Gently press to make the dough to make a ball. Place on a lightly floured surface. Gently roll to a rectangle of 1-inch thickness. 7. Cut them into rounds using a cutter or cut into your desired shape. Place the scones in the baking sheet. 8. Bake for about 20 to 25 minutes or until the scones puff up and the tops just start to brown. Cool for 5 minutes and serve. Navratri is starting on 13th October this year. Sundal is one of the important neivedhyam (offering) prepared during this festival. Sundal is nothing but a healthy salad made with legumes or lentils and coconut, tempered with mustard seeds, split black gram, red chillies and curry leaves. On each day, different variety of sundals are made and offered to God. 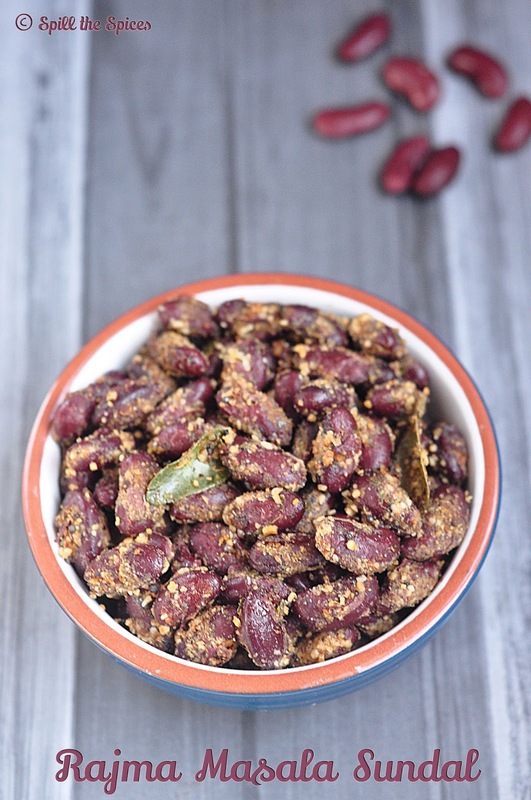 Usually beans like green gram, cow peas, chickpeas are used to make sundal but now a days we make sundal with whatever pulses or beans are available. Today I'm sharing a spicy red kidney bean sundal with a special ground masala. You can make this sundal plain just by adding coconut, green chillies and the tempering. 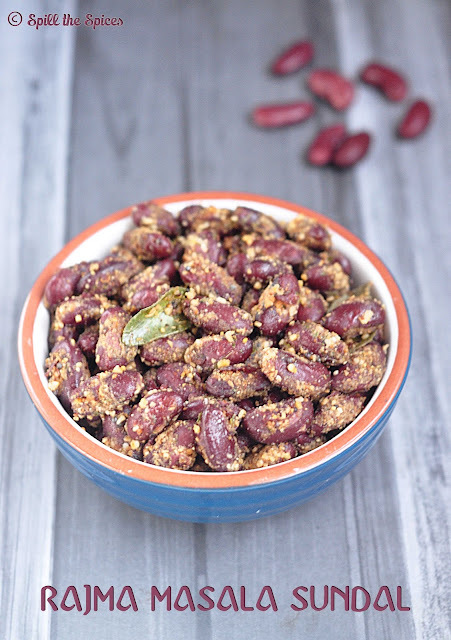 Do try this healthy sundal for this Navratri for a change! Check out other sundal recipes too. 1. Soak the kidney beans overnight or for atleast 8 hours. Drain the water and add fresh water. Pressure cook until soft. Drain and set aside. 2. In a small pan, roast chana dal, coriander seeds, red chillies, black pepper and cumin seeds until light golden color. 3. Cool and grind to a coarse powder. Add the coconut and pulse it 2 -3 times. 4. In a pan heat oil and add mustard seeds. When it splutters, add urad dal, asafoetida and curry leaves. 5. Add the rajma, turmeric powder, salt and saute for 2-3 minutes. Then add the ground masala and fry for 2-3 minutes. You can add the coconut at the end instead of grinding along with the masala. Adjust chillies according to your spice preference. If using canned beans, drain the water and wash well. Add less salt as canned beans already have salt. 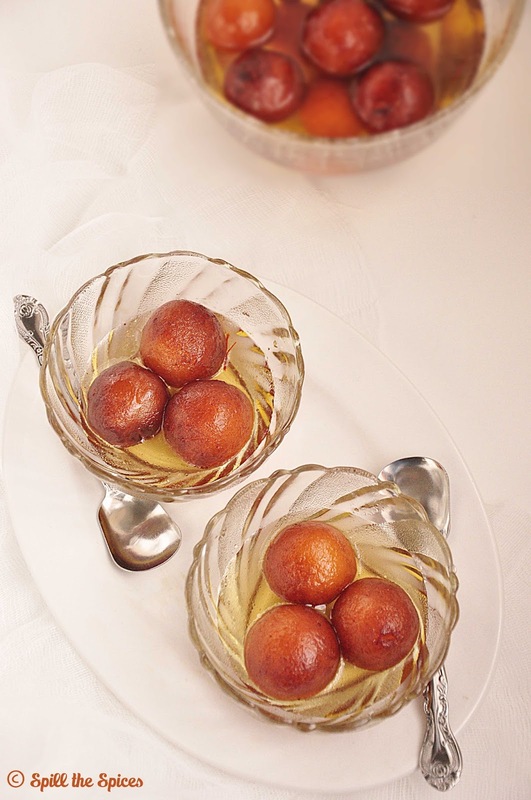 Most of the time, we get the instant ready made packets but making gulab jamuns from scratch is not so difficult. Getting the right dough consistency and temperature to fry is the key to perfect jamuns. 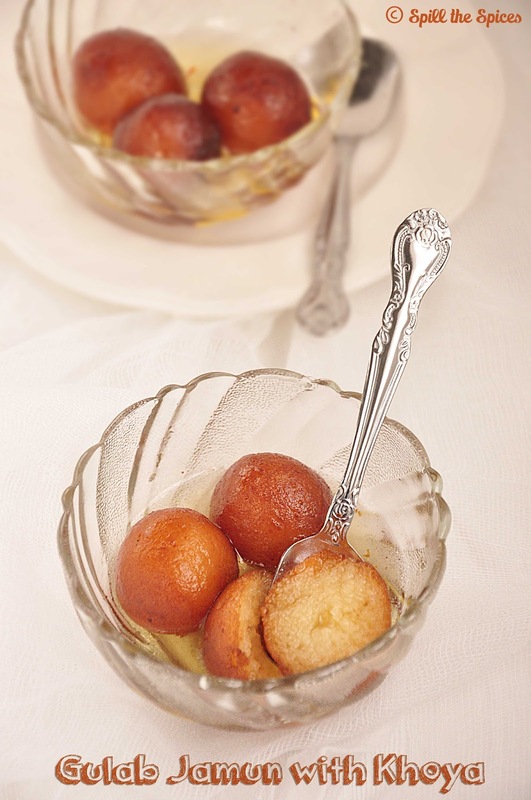 The gulab jamuns made with khoya are my favorite. The jamuns soaked in rose scented sugar syrup just melt in mouth. You can make khoya from scratch or use store brought khoya like I did. 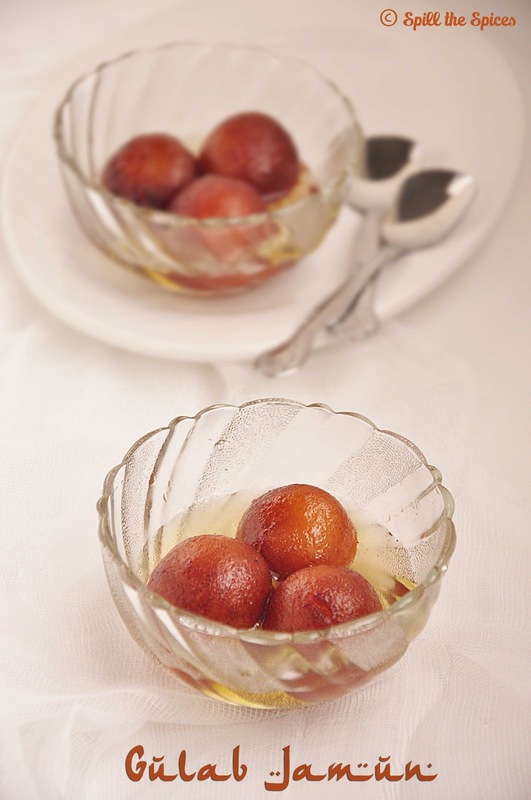 For the coming festival season, do try this easy gulab jamun with khoya. On this same day, 4 years back, I started this blog and today I feel extremely happy that I am still able to continue my passion. This would not have happened without the support of my loving hubby, my family and of course my friends and readers. I thank each one of you from the bottom of my heart for the love and constant support. 1. Bring khoya to room temperature. Crumble with hands and add to a large bowl. Add maida, cooking soda and mix well. 2. Add water, a teaspoon at a time and make a smooth dough without cracks. Don't knead the dough too much. 3. Make small equal sized balls. Make sure its smooth and does not have any cracks. Keep the balls covered. 4. To make sugar syrup, add sugar, water, cardamom, rose essence, saffron in a sauce pan and mix well. 5. Once the sugar dissolves completely, bring to boil and then simmer for 8-10 minutes. Remove from heat and set aside. 6. Heat oil for deep frying. Once the oil is hot, turn down the heat to low. Add the jamuns and keep turning them to ensure even cooking. 7. Fry until they turn dark golden brown. Drain on a kitchen towel and immediately add them to the warm syrup. Let it sit for 3-4 hours. Do not knead the dough too much. Just bring everything together to form a smooth dough. Roll the balls smoothly making sure there are no cracks. If there are cracks, sprinkle little water to make the dough smooth. Always fry in low-medium heat otherwise the jamuns will not get cooked inside. If the syrup has cooled down, warm the syrup before adding the jamuns.